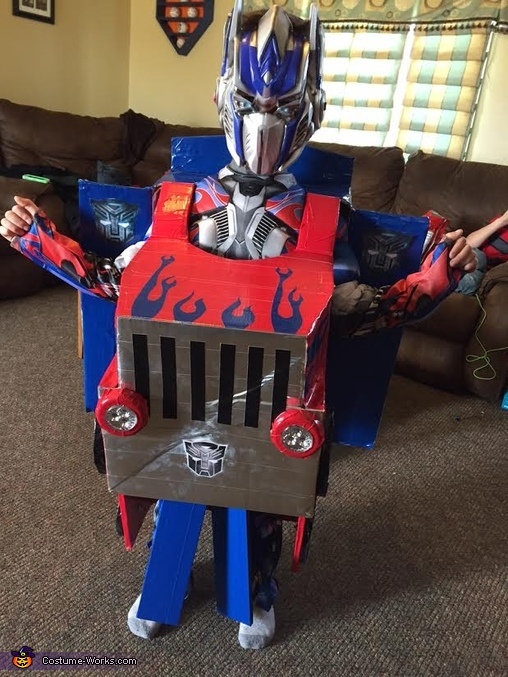 This is what happens when your child wants to not only be Optimus Prime for Halloween, but also be able to transform into the semi truck version, and be able to roll! The only question remaining... how is he going to carry his candy?! The truck part of the costume is made out of colored duct tape and cardboard. The leg part is made of wood and wheels on casters, which unfold so that the truck can roll. We bought the mask and suit. The headlights are push lights. The YouTube video shows my son transforming from the Optimus Prime in the semi truck version, and rolling. It also shows some steps while creating the costume!